Although, still performed in Japan, the truly historical and traditional Shito-style wedding ceremony, is not as common as it once was. 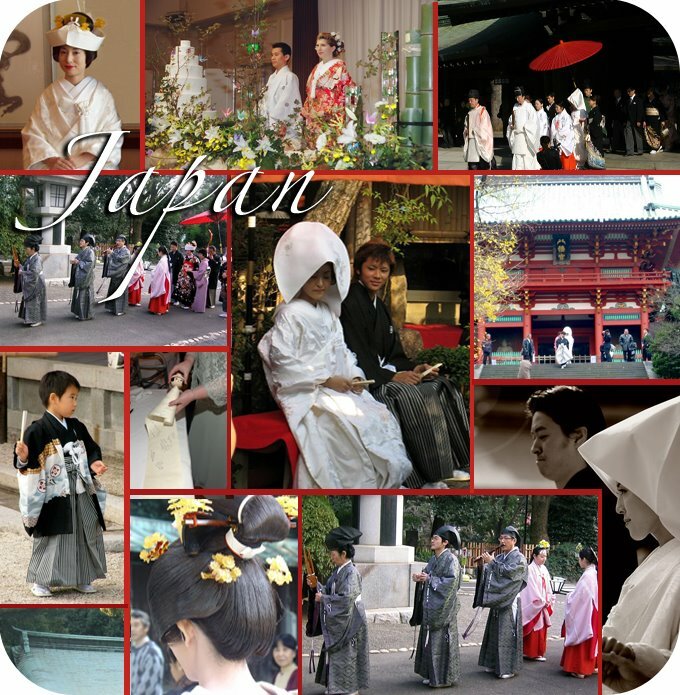 If you are ever lucky enough to be invited to or be apart of one of these weddings, you have to question why any bride or groom of origin Japan, would have any other type of ceremony. Therein lies the story behind the ceremony, which involves the grooms Mother being the head of the household, etc. To be truly ritualistic, you would follow this belief system as well. These ceremonies were performed in Shinto Shrines that were simply amazing. Today in Japan many of these shrines are available to couples who prefer to follow the traditions of Japan. The bride wears a white kimono and an elaborate headpiece covered with many ornaments to invite good luck to the happy couple. A white hood is attached to the kimono, which the bride wears like a veil to hide her 'horns of jealousy' from the groom's mother, who will now become the head of the family. Japanese grooms wear black kimonos to their wedding ceremony. The average cost of a typical wedding and wedding party in Japan is said to be a couple million yen, and the number of guest ranges from 50 to 200 for an average couple.